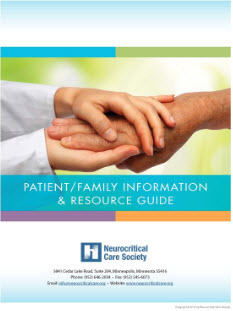 Neurocritical care is the intensive care management of patients with life-threatening neurological and neurosurgical illnesses such as massive stroke, bleeding in or around the brain (subarachnoid hemorrhage, intracerebral hemorrhage, subdural hemorrhage, intraventricular hemorrhage), brain tumors, brain trauma, status epilepticus, nerve and muscle diseases (myasthenia gravis, Guillain-Barre Syndrome), spinal cord disorders and the cardiopulmonary complications of brain injury. Neurocritical care provides the interface between the brain and other organ systems in the setting of critical illness. Patients are taken care of within a single specialized unit. Neurocritical care units specialize in managing the unique needs of such critically ill patients. In the practice of neurocritical care, we treat patients with truly life-altering disease states. The uncertainty of neurologic prognosis can leave both families and providers feeling doubtful and defeated. We all need reminders to keep hope and reinforce our resilience. Stories of Hope, a feature within NCS’ Currents publication, tells the stories of patients who have fought their way to recovery and the experiences of their family and/or medical providers. By sharing these stories, we remind each other of what we are all working for and reinforce each other’s resilience and hope. A HIPAA release is required with all submissions. Stories are encouraged to take different perspectives into account, including nursing, family, friends and providers. Headshots of authors are required. Photographs of patients, families and the clinical team are strongly encouraged. Stories should relay diversity of perspective and include direct quotations. Remember that the goal of these stories are to spread hope; the running theme of each story should reflect this goal. You will be working closely with our editorial team to come up with the finished product. Read stories from patients and their families who have survived a traumatic brain injury. Neurointensivists are physicians specially trained in neurocritical care. Their primary training may be in neurology, neurosurgery, anesthesiology or internal medicine, but they have undergone additional subspecialty training to care for the unique needs of neurocritically ill patients. Along with treating neurological injuries, neurointensivists also manage medical complications such as heart arrhythmias, lung or blood stream infections, blood clots, liver or kidney failure and a variety or respiratory disorders. Neurointensivists are able to provide complete care for patients by integrating and balancing the management of both the brain and the body. Neurointensivists provide medical management and perform many bedside invasive procedures (such as intubation, central line placement, and brain pressure monitor placement). In many facilities, neurointensivists are the leaders of the multi-disciplinary neurocritical care team. Nurse practitioners (NP) and Physician Assistants (PA) work directly with the care team to deliver patient care. NPs and PAs deliver medical care, perform procedures, write orders and help execute the daily plan of care for neuro-critical care patients. NPs are advanced practice nurses who have undergone additional training to become nurse practitioners. Physician assistants train for their role in working with physicians. Many NPs and PAs undergo specialty training in neurocritical care. Most patients with neurological illness or injury require rehabilitation to prevent and treat long-term problems. This process begins early in the hospital stay, while the patient is still in the neuro-ICU. Examples of rehabilitation professionals include physical therapists, occupational therapists, and speech language pathologists. Neurosurgeons perform brain and spine surgery and are essential for the care of many neurologically ill patients. Typical operative procedures include the removal of brain tumors, obliteration of intracranial vascular abnormalities, and spinal surgery to name a few. Neurosurgeons and neurointensivists work closely in the daily decision making process for critically ill neurosurgical patients. Interns, residents and fellows are commonly referred to as housestaff. They are all physicians who have earned their medical degrees, but are at varying stages of clinical training. Interns are first year residents who have just graduated from medical school. Residents are trainees focusing on a particular specialty (in the neuro-ICU they are typically training in neurology, neurosurgery, internal medicine or anesthesia) and fellows have completed residency and are training in specific medical sub-specialties. Neurocritical care is a subspecialty with its own fellowship training process. The housestaff work under the direction of the attending neurointensivist. Social workers provide additional support to guide families through the rehabilitation and discharge process. Social workers can provide information on insurance coverage and home care, as well. They are also available to provide spiritual and emotional support to families in need. Interventional endovascular physicians perform diagnostic and therapeutic angiographic procedures. An angiogram involves the placement of a catheter into the artery in the thigh with the injection of contrast into the arteries that enter the brain. Through minimally invasive techniques, these physicians can treat a variety of vascular problems such as injecting clot-busting medication into brain clots to treat stroke, coiling off aneurysms (abnormal ballooning of blood vessels that is prone to rupture) to treat subarachnoid hemorrhage or stenting of stenotic (narrowed) carotid arteries, among others. Pharmacists are an integral part of the neurocritical care team. They work with the physicians and nurses to ensure safe and effective use of medications. Pharmacists provide information on selecting the correct medications, proper dosing, and potential side effects. Pharmacists work with the team to monitor the impact of medications on the patient’s condition so that changed can be made if needed. Respiratory therapists (RTs) work with the doctors and nurses to ensure that breathing is adequate using oxygen, a ventilator, and other treatments as needed. Social workers provide emotional support. They may also address financial concerns and help patients and families prepare for discharge. Some hospitals have case managers or specially trained discharge planners for this purpose. Chaplains provide spiritual support throughout the patient’s hospital stay. Nurses provide bedside care for patients in the neuro-ICU and are invaluable members of the team. Nurses are responsible for closely monitoring the patient’s condition, administering medications, performing treatments, and educating patients and families. Nurses ensure smooth and consistent patient care. Nurses who care for critically ill neuroscience patients are specially trained to recognize subtle changes in patient condition so that the team can quickly intervene. Clinical Nurse Specialists are advanced practice nurses who work with patients, families, nurses, and other members of the health care team to improve outcomes for patients. In a neuro-ICU Neurocritical care trained Physicians and Nurses care for acutely ill patients with diseases of the brain, spinal cord and nerves that often have associated medical problems complicating their care. Below is basic information on some commonly treated ailments in the neuro-ICU. Please consult your physician for more information about any of these conditions. SAH is a type of bleeding that occurs in the membranes that surround the brain and is typically due to head injury or the rupture of an aneurysm. An aneurysm is an abnormal ballooning of an artery causing the artery to weaken and rupture. Smoking, high blood pressure and cocaine use can contribute to the formation and growth of aneurysms. Most aneurysms rupture when patients reach age 40-60. Aneurysms should be repaired as soon as possible either with surgery or endovascular coiling. The next 3-14 days after aneurysm rupture represents the vasospasm period. During this time, other brain vessels can become irritable and spasm or clench up. Spasm limits the amount of blood that can pass through that vessel to supply nourishment to the brain. This can at times lead to strokes. Neurointensivists carefully watch patients for the development of vasospasm so they can intervene with medical or endovascular treatments to prevent stroke. Most subarachnoid hemorrhage patients will spend at least 1 week in the ICU. Outcome after SAH depends primarily on the patient’s age, his or her clinical status at presentation (depth of coma etc,) and the amount of bleeding that occurred at the time of aneurysm ruptured. ICH is another type of bleeding in the brain that occurs within the brain tissue itself. ICH often related to high blood pressure, vascular malformations (abnormal tangle of blood vessels) in the brain tissue, brain tumors that bleed, blood thinners, or an entity known as amyloid angiopathy which implies vessel abnormality that occurs in older patients. Some types of ICH are treated with surgery, though most are not. Intracerebral hemorrhages can rupture into the fluid filled spaces within the brain called the ventricles. When this occurs patients often need drainage of the blood and spinal fluid through a tube placed through the skull and into the ventricle. Prognosis after ICH depends on the size of the bleed, the presence of intraventricular blood, the clinical condition of the patient at presentation, the age of the patient and the location of the blood. TBI can result from blunt trauma (falls, motor vehicle accidents etc. ), or penetrating trauma (such as gunshot wounds, stab wounds etc.). There are many types of brain injury following head trauma including bleeds around the brain such as subdural or epidural hemorrhage and injury to the brain tissue itself such as contusions or bruising of the brain. Rapid acceleration- deceleration injury (as occurs in motor vehicle accidents) can cause shearing of the brain tissue which is called diffuse axonal injury. Elevated pressure in the skull is a serious consequence of TBI and must be treated rapidly and aggressively. Many types of TBI are treated by surgically removing the blood (subdural, epidural hemorrhage) or part of the skull to treat the pressure in the brain. Special medications can also be given to lower brain pressure. Ischemic stroke occurs when arteries that provide blood and oxygen to the brain get clogged, preventing blood flow. Clots may travel to the brain from the heart or other blood vessels or may form at an atherosclerotic plaque in a blood vessel. High blood pressure may contribute to abnormalities in small blood vessels leading to strokes. It is important to recognize the warning signs of stroke (FAST: Face weakness, Arm weakness, Speech difficulties, Time of symptoms), as well as vision abnormalities, difficulty walking etc. because special clot-busting medications can be delivered to treat ischemic stroke if given within a narrow time window. Clot busters can either be given through the veins or directly into the arteries via an angiogram at certain specialized facilities. Large strokes may require surgery to treat swelling of the brain. There are many different types of brain tumors, including primary brain tumors (glioblastoma multiforme, astrocytoma, oligodendroglioma, meningioma, pituitary adenoma) and metastatic brain tumors which are tumors that have spread to the brain from other parts of the body (lung, breast, kidney). Depending on the location of the brain tumor, patients will have different neurologic deficits such as speech difficulty, weakness, numbness, personality changes, or difficulty walking. Most brain tumors are treated with a combination of surgical resection, chemotherapy, and radiation therapy. Seizures are abnormal electrical discharges that propagate through the brain. Seizures can occur in patients with epilepsy, but also can be provoked by brain injury from trauma, strokes, tumors, infection, alcohol abuse, metabolic imbalance or certain drugs. Status epilepticus is defined as uncontrolled and persistent seizures. Status epilepticus can lead to brain injury and must be treated without delay. Patients typically require brain monitoring called electroencephalogram (EEG) to help treat status epilepticus. A variety of different medications are available for the treatment of status epilepticus. Certain diseases of the muscle (myopathy) and nerves (Guillain-Barre Syndrome) and the junction between the muscles and nerves (Myasthenia Gravis) can cause profound weakness. Some patients require the mechanical respiratory support of a ventilator. Some of these neuromuscular disorders can be treated with intravenous gammaglobulin or plasmapheresis and many patients recover their strength over a period of days to months. An infection of the membranes surrounding the brain is called meningitis, while an infection involving the brain tissue itself is called encephalitis. Infections may be caused by bacteria, viruses, fungi or parasites. Organized pockets of infection within the brain are called abscesses. Most infections are treated with a combination of antibiotics. Some abscesses require surgical drainage. Patients with heart infections such as endocarditis are at particular risk for infection spreading to the brain. Spinal cord injury can occur from trauma, infections, inflammation, metabolic deficiencies, infection, strokes of the spinal cord or injury to the bones or discs that surround the cord. Some types of spinal cord injuries require surgical treatment, while others require treatment with steroids, intravenous gamma globulin or plasmapheresis. The information posted here by the Neurocritical Care Society or any third party is intended for informational purposes only, should not be considered medical advice and is not intended to replace consultation with a qualified medical professional. You should consult your medical provider directly regarding your health and any specific medical questions you may have. The NCS Patient Family Brochure has been translated. Click on the link below to download the printable PDF in your desired language.